We co-cordially invite you for an experiential tour of ‘Food & Beverage’ outletito join us in celebrating our inaugural Culinary Competition. Kindly consider this as an official invitation for the ‘Hyatt Culinary Challenge’. 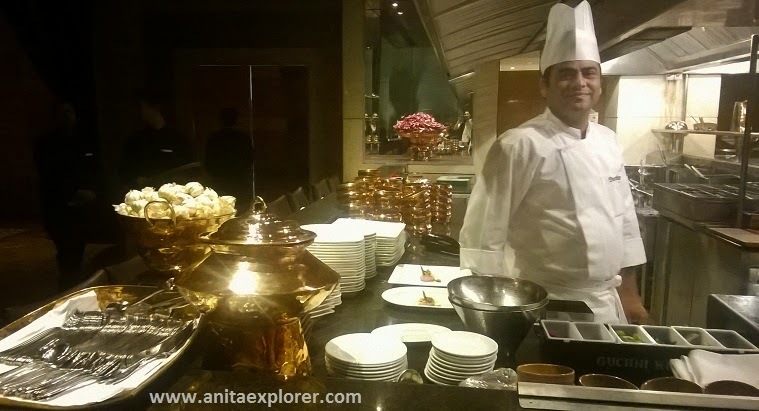 An initiative conducted by Hyatt hotels to engage with people who are passionate about cooking. The passionate foodie in me was very delighted to find the above email invitation last week. This was followed by a telephonic invitation too and I found myself with some other Bloggers and Social Media influencers in Hyatt Regency Kolkata. This was my second visit to Hyatt Regency Kolkata and unlike my first visit that was for a Software Conference, I got to spend more time this time. We got to experience the Hyatt hospitality. The close-knit team made us feel very comfortable as they took us around for the experiential tour. 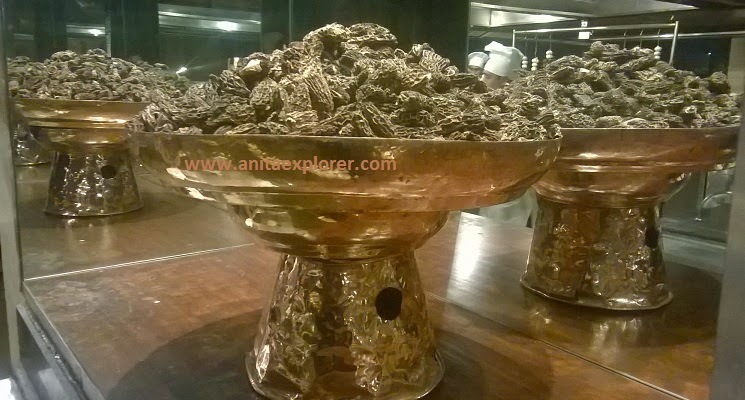 We observed that apart from great food, Hyatt Regency Kolkata has aesthetic interiors. Needless to say, we went click-happy! It was amazing to find 80 labels of wine with the wine cellar on display! I loved the Bakery section with so many pastries, cakes, fresh bread etc. 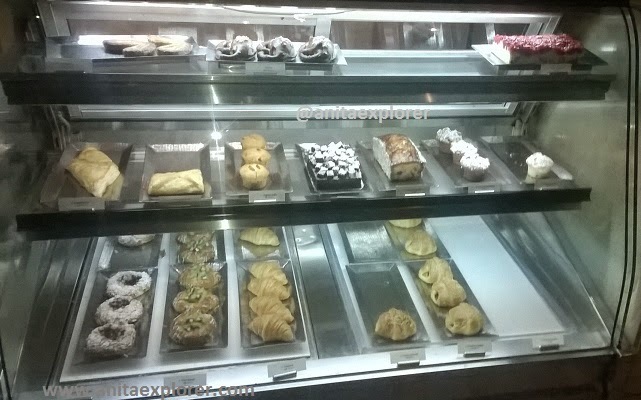 One section of the Bakery with yummy fare! We started with the La Cucina, the only authentic Italian restaurant of Kolkata. It had won the Indo Italian Chamber Award. Delicacies like Pizza with Parma ham, Caesar salad bar, warm potato salad and plenty more are available in the Buffet. We saw the Black Truffle, a mushroom native to France. Dogs are used to sniff and identify it. At Rs 17,000 a Kilo, Truffle is pretty expensive. Waterside Cafe is the All Day Dining Restaurant that is open for 24 hours, with menus that are varied. 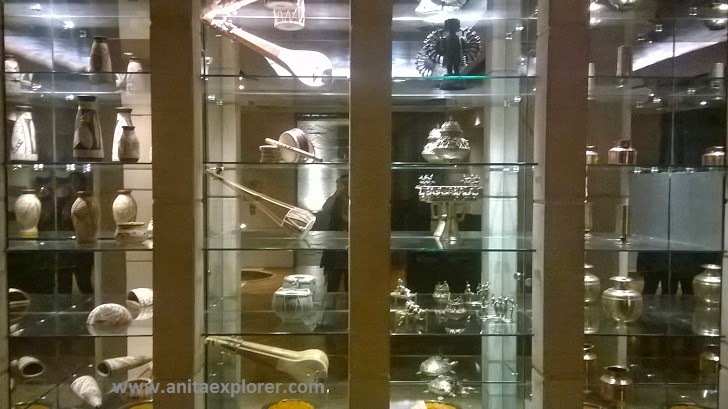 Hyatt Regency Kolkata has a cool display. I liked this one with so many musical instruments and show -pieces. 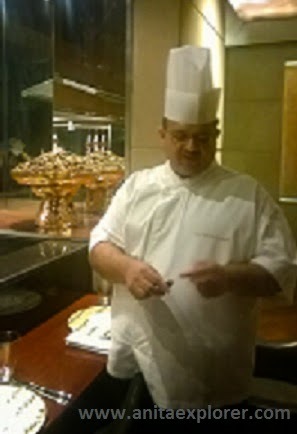 Hyatt Regency Kolkata's Indian Restaurant, Guchhi, is a la carte. A sumptuous range of Indian food where the menu offers many dishes like Mutton Rezala & Makai Mutter Malai. Guchhi has been named after a mushroom of the same name. Guchhi, the mushroom sells at Rs 17,000-35,000 per Kilo. 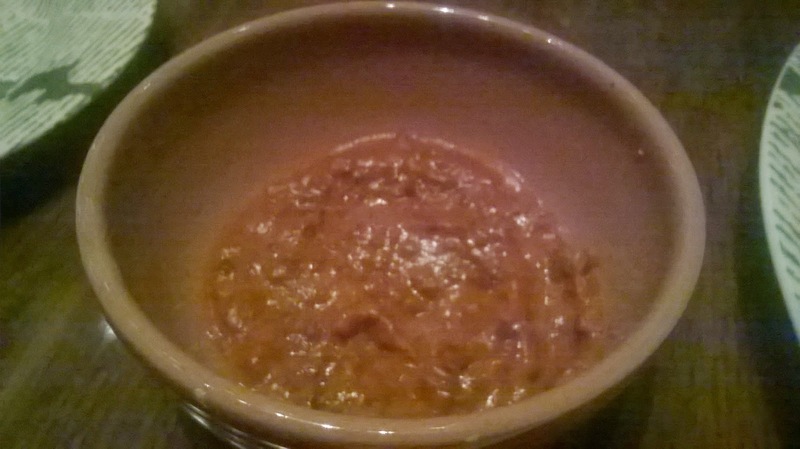 We got to sample a starter made of Guchhi & the famous specialty- Guchhi Dal. The aroma and taste was distinct. 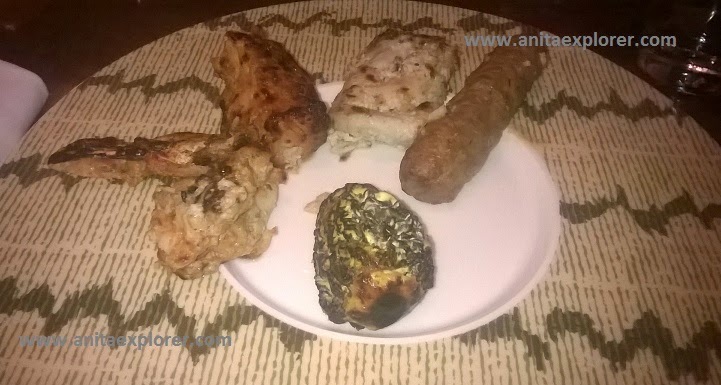 The Veg & Non-Veg starters were too good as was the main course. 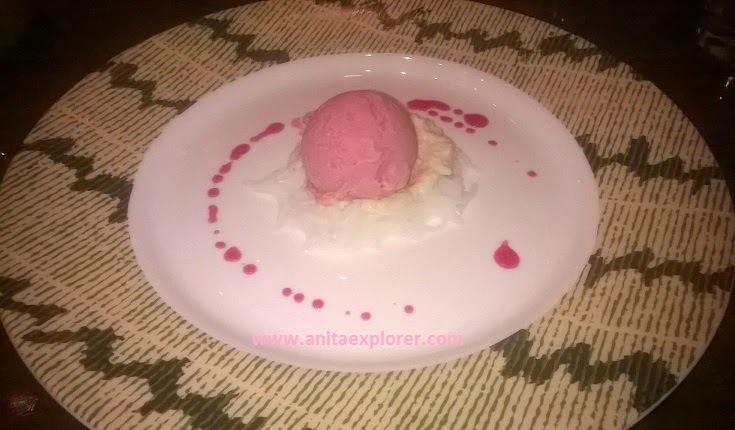 I loved the dessert- Kulfi too. Many Outlets of Hyatt Regency Kolkata find themselves as nominees for the Times Food And Night Life Award 2015. You can vote for them HERE. Midweek Poolside Rendezvous- With funky songs in the background, party by the Poolside, while savoring sizzling snacks and drinks. Lobby Festive Shop- Treats and sweets- chocolates, cookies, cakes, pies... at the fabulous ginger bread outlet in the lobby for the entire December. My recipe- Mango Vermicelli Kheer was amongst the 25 recipes shortlisted for the Hyatt Culinary Challenge 2014! Do you enjoy Cooking? Are you a foodie too? Do share in the comments below. I am glad you enjoyed the buffet, Anita. 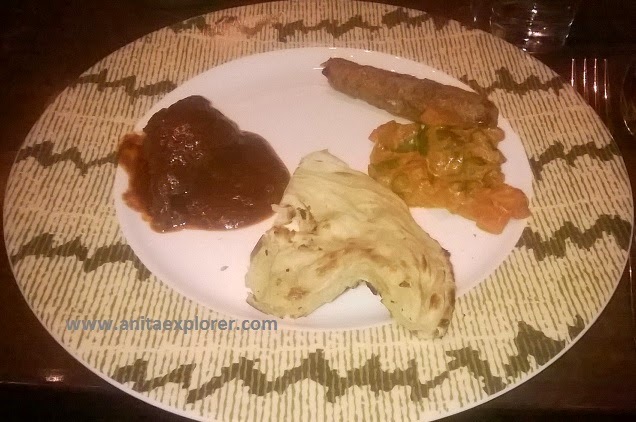 We dined a-la-carte in Guchhi, the Indian restaurant there. wow am hungry soul-sis on the veg part of the food! Must have been an amazing experience! Where is your pic? I have a small keller and used to be a big fan of white wine! Needless to say amazing post and nice pictures too! Thank you so much for your kind words & appreciation, Josie! It's a pleasure to share! How tempting you made this post, so mouth watering! Great food always has that effect :) Thanks! Thanks for your maiden comment! Nice Post! Mouthwatering food! But, could you post higher resolution pictures? It seems like the picture quality isn't doing justice to the food! Thanks for stopping by & sharing your feedback! I appreciate it. As there are many pics, I cropped the selected ones and attached them so as to be light on the bytes. Thanks Vinitha :) Tasted better! I can open the pics. Please do try opening using your cellphone & do let me know. It's great to know that you have stayed with Hyatt Regency and had Mishti Doi there.